Since the Age of Aquarius dawned, popularly thought to have been at the end of the last century (i.e. the 1990s), it seems that more and more mysteries are being revealed to us, some of them on our own doorstep. There have been several exciting discoveries of hoards of Roman coins and treasures; new archaeological revelations such as pyramids throughout the world; and Neanderthal remains of early homo sapiens, shedding new light as to how long man has walked upright on this earth. One of the things dowsing has enabled us to discover in increasing numbers is symbols across the landscape, formed by easily-dowsed energy lines. We heard recently about the ancient Glastonbury Zodiac, first mentioned in 1935; there is also a Wye Valley Zodiac, a Kingston-upon-Thames Zodiac, the Lizard Zodiac in Cornwall, a Bodmin Moor Zodiac, and even a Sheffield Zodiac in South Yorkshire. Zodiacs in the landscape are thought to have been created around c. 4300 BC. Just because you can’t see them, doesn’t mean they aren’t there! These celestial reflections - as above, so below - aren’t limited to signs of the zodiac. Dowsing has discovered a large ten-pointed, ten-sided decagon of energy lines centred on the Malvern Hills. 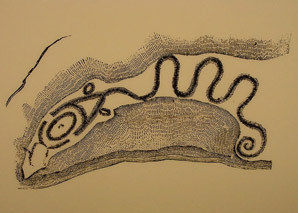 One of the most famous shapes is probably the Serpent Mound in Ohio, USA, discovered in 1848, and thought to have been created by Native Americans some 1,000 years BC. The serpent appears to have an egg in its mouth, and no doubt represented fertility, possibly the fertilisation of the female egg by the serpent - the male sperm. Further dowsing revealed several energy lines, and significant structures - mostly churches - where the lines crossed. 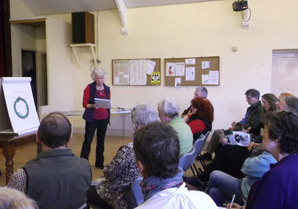 Ros followed the trail and found herself at churches built on power points in Awre, Fretherne, Upper Framilode, Longney, and at Lydney Temple, across the Severn. Perhaps that’s something else that we could start on our own doorstep too.